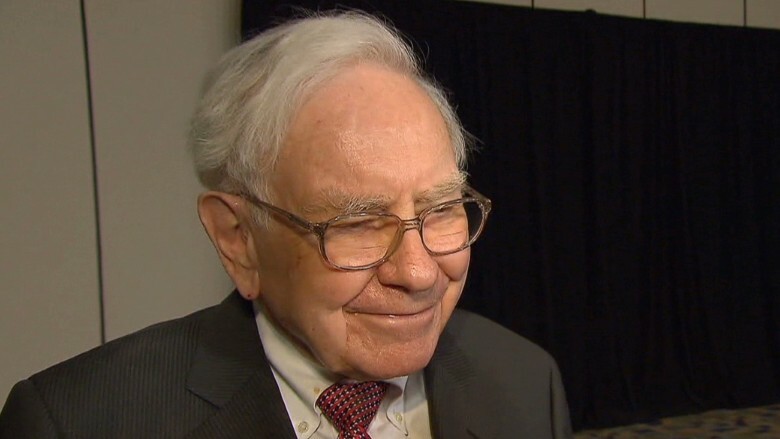 Warren Buffett, the billionaire CEO of Berkshire Hathaway, expects even better times ahead for his company. He also said that he knows who will one day replace him. Of course, Buffett did not share that name with the rest of us. "The board and I believe we now have the right person to succeed me as CEO -- a successor ready to assume the job the day after I die or step down," he wrote in his latest annual letter to investors. Buffett added that the next Berkshire CEO would be someone that already works at Berkshire and is "relatively young." And while Buffett chose to be coy, Berkshire's vice chairman and long-time Buffett friend Charlie Munger seemed to suggest that it's a two-man race to succeed Buffett. Munger, in his own remarks in Buffett's letter, specifically named Berkshire reinsurance head Ajit Jain and Berkshire Energy CEO Greg Abel as "proven performers who would probably be under-described as 'world-class.'" Munger added that he doubted either Jain or Abel would ever leave Berkshire or seek to change how the company is run. This is Buffett's 50th annual shareholder letter since he took control of Berkshire Hathaway (BRKA) in 1964. So it's only natural that it's time for Buffett to prepare Berkshire investors for life without him. Throughout the past five decades, Buffett has had a lot to say about the financial markets, economy and society. Last year, he even gave travel tips, urging people to consider flying to Kansas City, and then drive a rental to Nebraska, since airlines often have "jacked up prices" on flights to Omaha. This year, he even endorsed Airbnb as a way to save on lodging -- though it's hard to imagine Buffett endorsing the young tech company as an investment. But most Buffett fans read the letters for his advice on stocks -- even though Buffett has conceded that the portfolios run by his two investing lieutenants Todd Combs and Ted Weschler have outperformed his own lately. Buffett is a classic buy and hold investor who has largely shunned pricey technology stocks in favor of blue chips in the financial, industrial and consumer sectors. He has often urged investors to not panic and dump stocks due to fear. In this year's letter, Buffett stressed that investors should not confuse volatility and risk. He said that stocks "will always be far more volatile" than cash and other investments. But the bigger risk is not being in the market. Buffett said that "for the great majority of investors, however, who can -- and should -- invest with a multi-decade horizon ... their focus should remain fixed on attaining significant gains in purchasing power over their investing lifetime." The proof is in the returns. Berkshire's market value per share has increased by a jaw-dropping 1,826,163% in the past 50 years. To put that in perspective, the compounded annual gain is 21.6%, compared to 9.9% for the S&P 500. Another constant Buffett refrain: Don't bet against America. Better times lie ahead. That optimistic spirit was once again present in this year's letter. Buffett was particularly confident about the chances of continued success for Berkshire. He said that "the chance of permanent capital loss for patient Berkshire shareholders is as low as can be found among single-company investments" and added that the there is "essentially zero" risk of Berkshire being hit by any major financial problems. Buffett even joked that Berkshire would "always be prepared for the thousand-year flood" and "will be selling life jackets to the unprepared." That's a reference to some of the big investments Berkshire made in financial firms in the wake of the 2008 credit crisis. But he added that Berkshire is now so big, it will be tough to match the performance of the past 50 years. Buffett also stressed that the company is much more than an investing and insurance giant -- and he hinted at more deals to come. Berkshire bought railroad Burlington Northern Santa Fe in 2009 and teamed up with private equity firm 3G Capital to purchase Heinz in 2013. "Berkshire is now a sprawling conglomerate, constantly trying to sprawl further," he wrote, adding that it expected to partner even more with 3G. Still, some investors have questioned whether Buffett has lost his mojo. Big Berkshire investments IBM (IBM), Coca-Cola (KO) and American Express (AXP) have lagged the market lately. Related: Warren Buffett ditched Big Oil. Dumb move? However, other Berkshire stocks -- most notably top holding Wells Fargo (WFC) -- have done extremely well. Buffett refers to Wells, IBM, Coke and AmEx as Berkshire's "Big Four" investments. And he does not seem to be too concerned by the recent problems at the latter three. He said that all four "possess excellent businesses and are run by managers who are both talented and shareholder-oriented." And Berkshire's own stock has outperformed the S&P 500 over the past five years. The company is now the fourth most valuable in America, trailing only Apple (AAPL), Google (GOOGL) and Exxon Mobil (XOM). But Buffett did concede that he made one huge blunder last year. Berkshire's investment in British supermarket chain Tesco (TESO) turned out to be a flop due to an accounting problem at the retailer. Berkshire sold some of its Tesco stake in 2013 but didn't unload the rest until after the stock had plunged last year. Buffett took full responsibility for "the leisurely pace in making sales." "I made a big mistake with this investment by dawdling," he wrote. But even that error didn't wind up hurting Berkshire too badly. Buffett said that after-tax loss on Tesco was $444 million -- about 1/5 of 1% of Berkshire's net worth. One of the nice things about being so big is that you don't have to hit a home run every time you step up to the plate.